One on One Exclusive Charters operate from Noosa and offer offshore fishing, river and bay crusing along with sunset dining. All this takes place on a 34 ft KevlaCat Magnum Flybridge crusier. Our fishing charters are designed for Game Fishing – Bill Fish, Tuna, Mackerel, Wahoo and Dorado. Reef Fishing – Snapper, Sweet Lip, Jew Fish and drag jew, Red Emperor, Moses Perch, Venus Tusk, Maori Cod, Perch and many more. From November to May the Sunshine Coast is great for juvenile Black Marlin and Sailfish we catch them trawling or drifting with live bait and often get snapper as well. Longtail tuna appear in schools around the 10kg with Yellow Fin Tuna being caught earlier in November and December. Bonito arrive early as well often in September and can give you a good work out on light tackle. Mackerel arrive in schools as well and can be caught from November through to June if you are lucky. Spanish Mackerel are often around 10kg and spotted at 5kgs. We use different techniques to target these fish from metal lures being cast into a school through to burley and cube, but trolling with lures and bait can cover more ground. Wahoo can be caught if you are doing 10-15knots but they are not as common as the mackerel and is often caught going for Billfish. Dorado are another regular in these waters and are one of the best eating fish around. 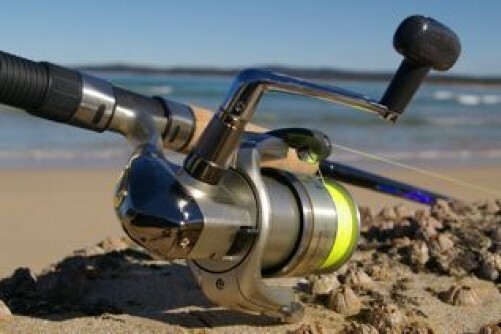 The reefs on the Sunshine Coast hold alot of variet of fish as listed above, so it is rare to come away empty handed, with Snapper as the prized catch. They are often caught in the winter from April to October but are there all year round and average upto 3kg with some bigger ones as well. Some of the species listed further up arrive at different times of the year depending on the currents. If fishing is not your thing then we offer crusies in the Bay and on the river. In the Bay you can encounter whales, dolphons and turtles. If offshore fishing is not your thing then you can fish or cruise on the river. Fish targetted in the river are Flathead, Mangrove Jack, Whiting and Bream. What can be better than taking a sunset cruise with the loved one(s) and have dinner on the water. 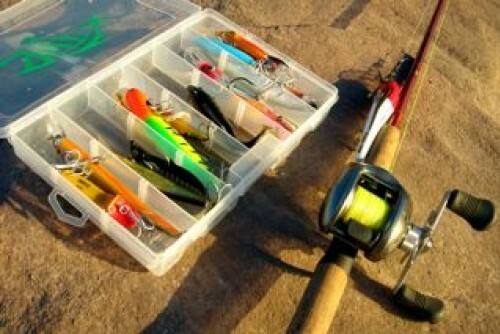 Fishing Charter Prices: $150 (1/2 Day – 5hrs), $200 (3/4 day- 7hrs), $250 (9hrs). Exclusive boat charter – $900 (5hrs), $1200 (7hrs), $1500 (9hrs). Departure Point: Parkyn Crt , Tewantin. Return Time: Length of trip later. Inclusions: Light refreshments, fishing equipment and bait etc. Cheetah is a custom made 34ft KevlaCat Magnum Flybridge crusier and is extremely strong and is in Queensland survey so meets the strictest requirements. She is a twin hull with 4 water tight bulk heads. She is powered by 2 outboard 250hp Suzuki motors and has a self draining deck. 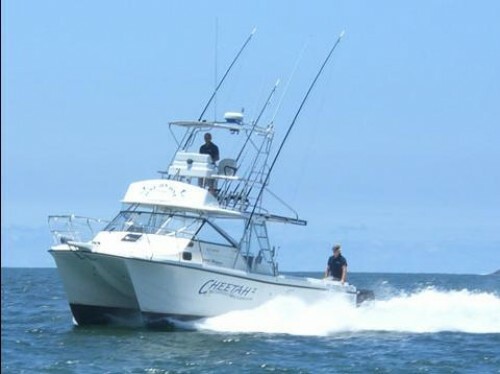 Cheetah is fitted with all the latest electronics, bait station, live bait tank and a large fish box. There is room on deck for 8 people and has a shower and toilet.